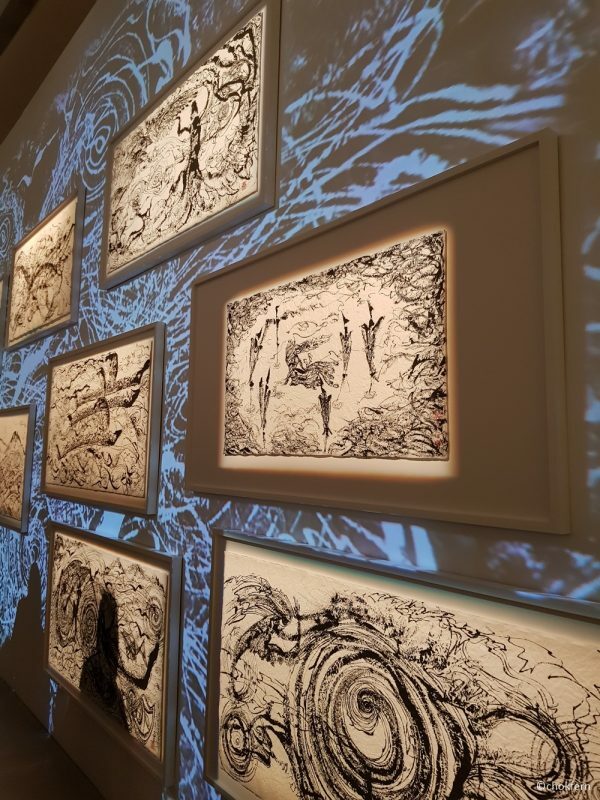 Was glad to attend the official opening of the Ink Mountain 墨山 exhibition and get to appreciate the artwork by Mark Chan and Brian Gothong. 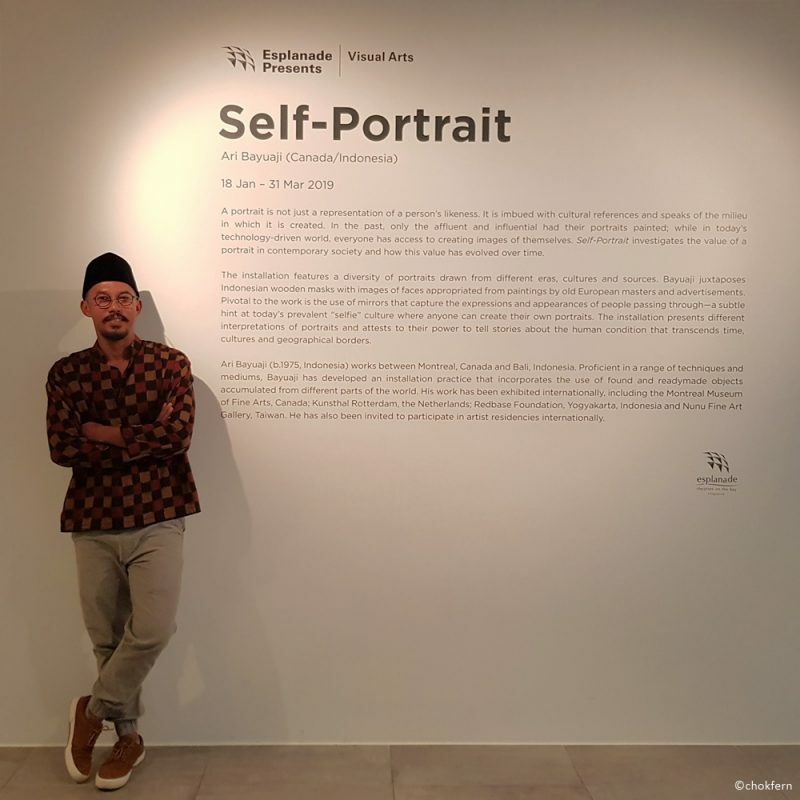 This exhibition is in conjunction with the Singapore Bicentennial which Mark Chan collaborates with Brian Gothong Tan whose video works helps reveal new layers and perspectives of Mark ’s paintings. Was quite surprise at the crowd for the gallery, but then, the collection is quite interesting and hey, Mark is performing! Mark was a distinguished national swimmer, he competed and won awards in national, regional and international sporting events, prior to his full-time pursuit of music and the arts. Mark’s practice transcends boundaries that spans genres, crosses art forms, combines worldly and spiritual influences, East and West, old and new, his work is inherently infused with deep spirituality and an intuitive understanding of diverse musical cultures. Mark seeks to discover the elements that unite the world we live in, and this unifying sensibility creates work that are seamless, original, powerful and popular. 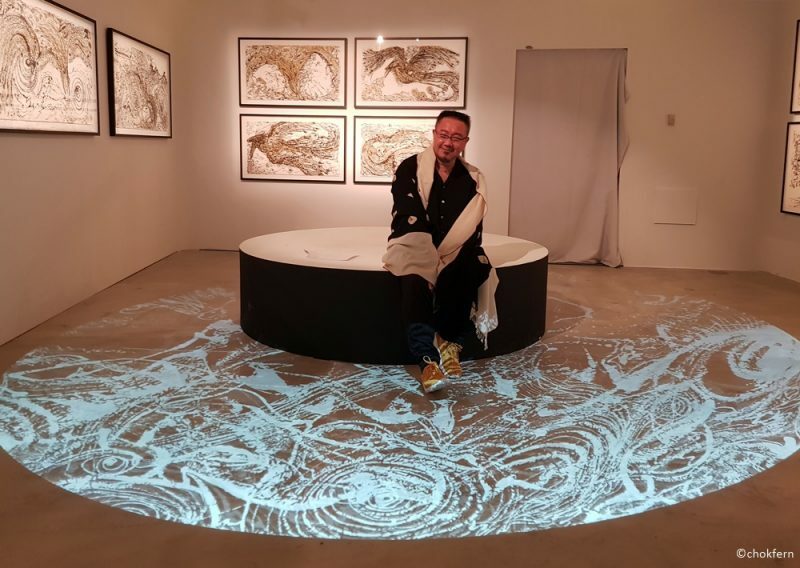 Brian Gothong Tan graduated from California Institute of the Arts in 2005 under the Shell-NAC Scholarship, and is best known for his cutting-edge and highly engaging works in theatre, film and installation art. He was conferred the Young Artist Award in 2012 and Singapore Youth Award in 2015, and has won the Life! Theatre Awards for Best Multimedia in 2005, 2008, 2012 and 2016. Mark has fashioned a world and language of his own, having his bold calligraphic strokes combined with personal, idiosyncratic techniques that break out of the strictures of traditional ink painting. 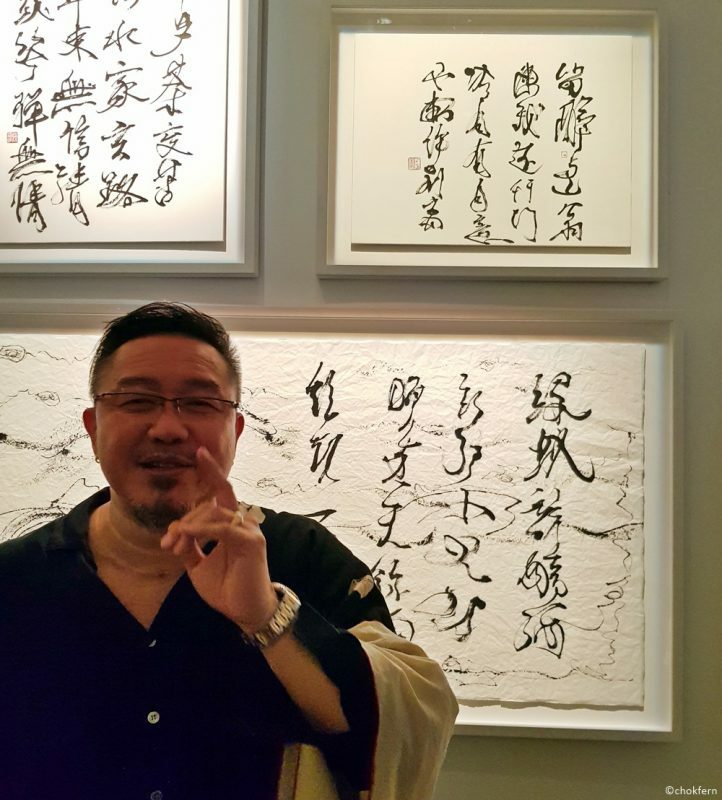 Ink Mountain 墨山 is Mark Chan’s personal and unique vision of the world where his paintings and calligraphy in Chinese brush and ink on distressed paper take centre stage. It’s is a world inhabited by a rich mythology: creatures and spirits and a modern blend of abstractions that glyph, glide and splatter suddenly into recognisable forms and figures. 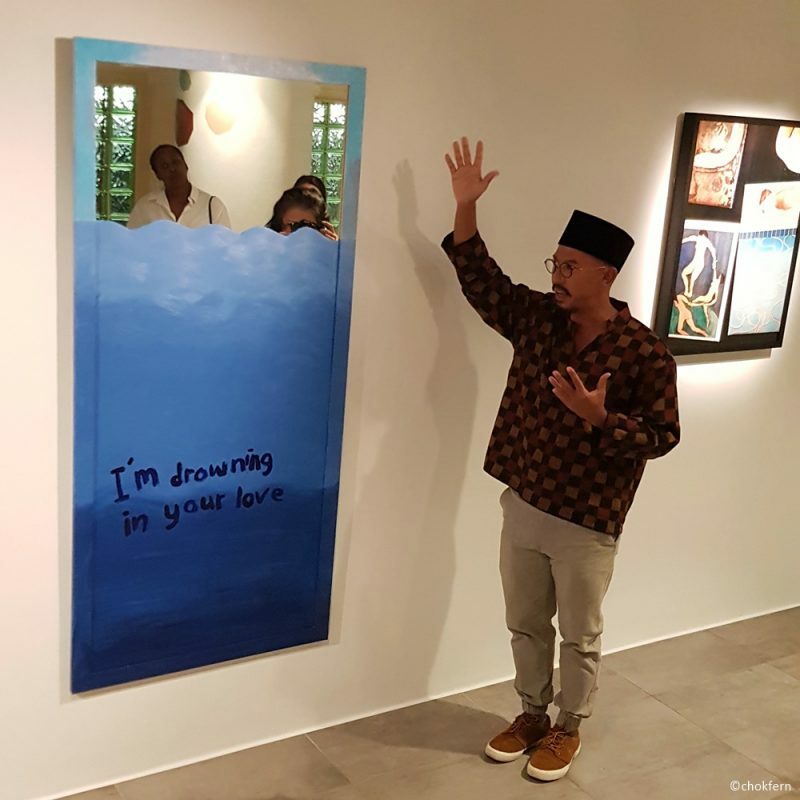 A compelling narrative thread runs through this immersive installation which has a deep connection to primitive roots, ancient mythology and the complex history and character of Southeast Asia. Sis is impressed by this artwork and who knows, it’s Mark’s ‘self-portrait’. LOL. 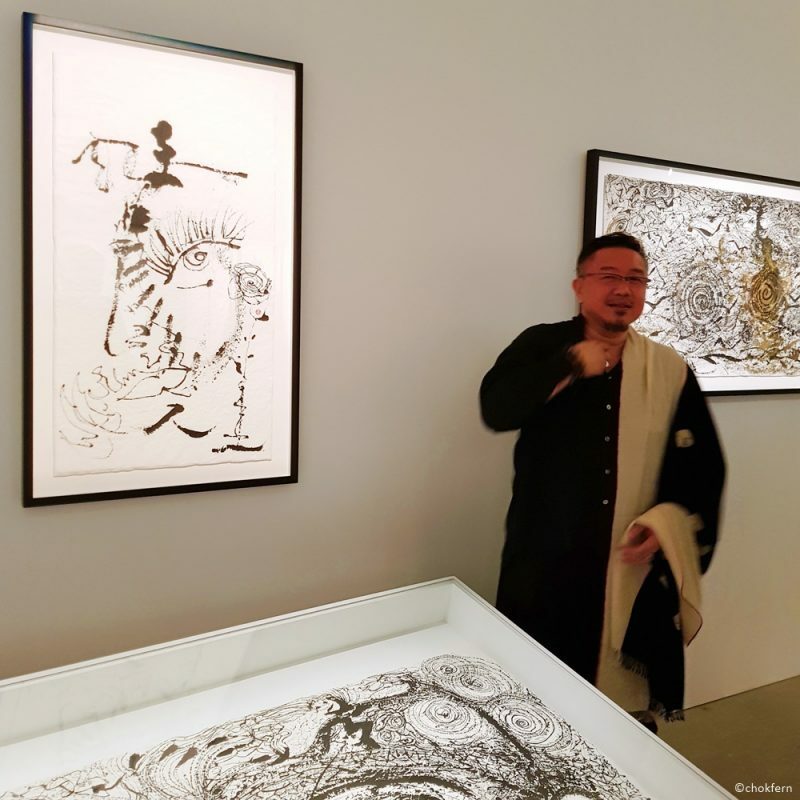 We are impressed by his artworks, and honoured to have him sharing on some of his insights when he was working on them. Side story: B happened to know an fellow artist who was present in the Ink Mountain exhibition, and we got the honour to have 2 artists sharing their artwork with us on a night!